The Royal Canadian Mint introduced a Wildlife series of silver bullion coins that officially launched on September 9, 2010. The Ottawa facility was commissioned to a maximum of 1,000,000 coins for each one of six designs. The coins were not sold directly to the public, but could be bought from a network of coin dealers around the world. Six unique animals found in the wilderness of Canada are represented through beautiful, detailed artwork embellished on each coin. The Silver Canadian Wildlife Silver bullion coins are all struck with 99.99% pure silver and are garnished with a face value of $5.00 Canadian currency. The coins were released one at a time over a three-year period. The front of each coin is designed with artwork depicting Queen Elizabeth II that was created by Susanna Blunt, a Canadian artist. Each coin bears the inscription: CANADA, 9999, FINE SILVER 1 OZ ARGENT PUR. The six designs include four designed by artist and designer William Woodruff, who is also an engraver at the mint. These included the Timber Wolf, Grizzly Bear, Cougar, and the Moose. The remaining two coins were designed by Emily Damstra, which included the Pronghorn Antelope and the Wood Bison. The Canadian Wildlife Silver coin series weigh 31.12 grams each. The first to be issued was the Canadian Wolf silver bullion coin in September 2010. The design on the reverse reveals a wolf standing proudly on a snowy landscape, evergreens gathered in the far distance. The full moon shines in the dark, night sky behind the lone wolf and creates the picture of a cold, snowy night in Canada’s northernmost territory. The second Canadian Wildlife Silver coin, the Canadian Grizzly, was released in January of 2011. This coin was adorned with the artwork of a fierce, Canadian grizzly bear. The majestic bear is poised on all four paws near a body of water, ready to pounce on a much-relished catch of fish. His wide jaw is opened and he appears to be calling out to warn others of his claim to the fishing where he stands. Maintains rise in the background. The Canadian Cougar coin was the third and released in September 2011. This ferocious cat stands with its front paws perched in a fallen tree limb. Its jaws are open wide and large teeth can be seen ready to clamp down on unsuspecting prey. Cascading mountains are shown in the background. By February of 2012, the Canadian Moose Silver bullion coin, the fourth in the series, was issued. Standing among low-lying brush, the massive antlers’ on this thickly furred mammoth are tilted back just enough to magnify their berth. A stately look on the moose’s face resembles the respect this animal is due. The Canadian Pronghorn Antelope was next. 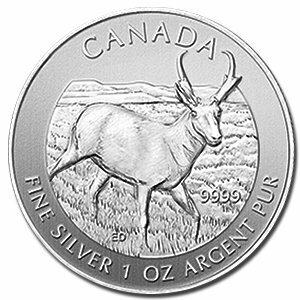 This fifth installment of these Canadian Wildlife Silver coins made its debut in September 2012 and carries the design of a Pronghorn Antelope standing among a grassy field. Above you can see the depiction of the Pronghorn Antelope on the 1 oz bullion coin. The final installment of this series is the Canadian Wood Bison released in February 2013. The rare site of a galloping bison is a picture of strength and endurance. Stately pines rise above the snowy landscape in the background. The six silver bullion coins in this series are not sold directly to the public by the Royal Canadian Mint, instead the Mint sells them through a network of dealers who then distribute the coins to the public.